First up is Bernard Gros whose cellars in the centre of Vosne-Romanée back onto those of Domaine de la Romanée-Conti. At present a large scale excavation is being carried out in the courtyard which Bernard joked could act as cover for a secret tunnel leading directly into his neighbours priceless cellar! Bernard is the liveliest, most jocular and ebullient of the Gros family. On our first meeting in 1999 I remember clinging for dear life as he sped round the village in his jeep after a long tasting in his cellar. Bernard maintains a traditional approach to wine-making. On that bitter morning the low temperature was impeding the malolactics of the 2001’s and so a rudimentary ring-heater was holding the temperature constant. His vineyards are in rockier areas than Michel’s, and his wines tend to be more powerful and sturdy than his brother’s. Recent vintages have expressed more finesse as the age of his vines increase. Bernard grows vines in Richebourg, Grand Echézeaux, Hautes-Cötes-de-Nuits and village Vosne. But on this tasting it was his stunning Clos de Vougeot 2000 which held the most promise: all silky smooth tannins and vibrant acidity. Michel Gros’ character seems more introverted and traditional than Bernard’s, but he has a wider array of vineyards (Hautes-Cötes-de-Nuits Rouge, Chambolle-Musigny, Vosne-Romanée 1er Cru Aux Brulées and a monopole in Clos des Reas amongst others.) According to Clive Coates, he is sceptical about the use of green-harvesting, but he told me that he practised some for the 1999 vintage, and may possibly extend it to all vines in the future. In some ways I find Anne Gros (left) as complex as her wines; on the one hand her life is dedicated to wine-making, yet on the other she laments the lack of time she can spend with her family. She is a somewhat private person, yet has a quirky and irreverent sense of humour and a refreshing frankness. 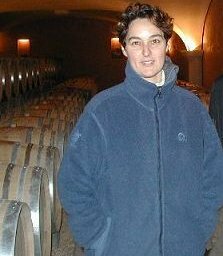 Anne Gros’ vineyards are located in Richebourg, Clos-Vougeot (Maupertui), Chambolle-Musigny and Vosne-Romanée. She also makes a very high quality Bourgogne Rouge and Blanc. Natural yeast are used, with little destemming, and her wines are lightly filtered (unfashionable, but Anne has a mind of her own). Personally I hold her wines in the highest esteem of the three Gros siblings, even though 1990 was the first vintage that was entirely domaine bottled. There is certainly a beguiling femininity and sophistication about her wines, in particular the Richebourg which displayed more complexity and finesse than that of Bernard. A beautiful perfumed nose soared from the glass of the 2000, soon followed by a concentrated, multi-layered palate, with velvety tannins and great concentration. It is clear that Bernard, Michel and Anne Gros are all conscientious viticulturalists who maintain their own personal styles in their wine-making. I had envisaged all three sitting round a table comparing and discussing each others wares, but Anne told me this rarely happens. Although their homes virtually neighbour one another, they each maintain their own privacy and adhere to their own philosophies in wine-making. Anne said “we have to open-minded but must maintain our own identities”.